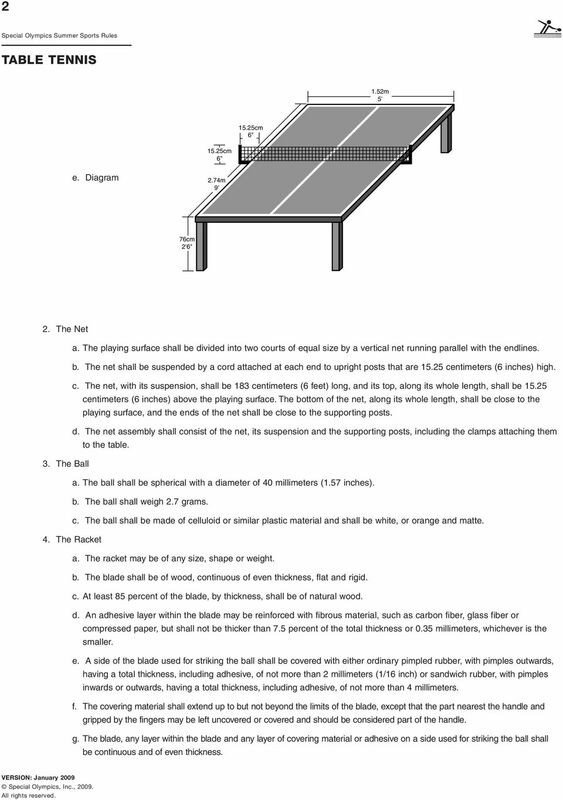 Download "TABLE TENNIS TABLE TENNIS"
1 1 The Official Special Olympics Sports Rules for Table Tennis shall govern all Special Olympics competitions. 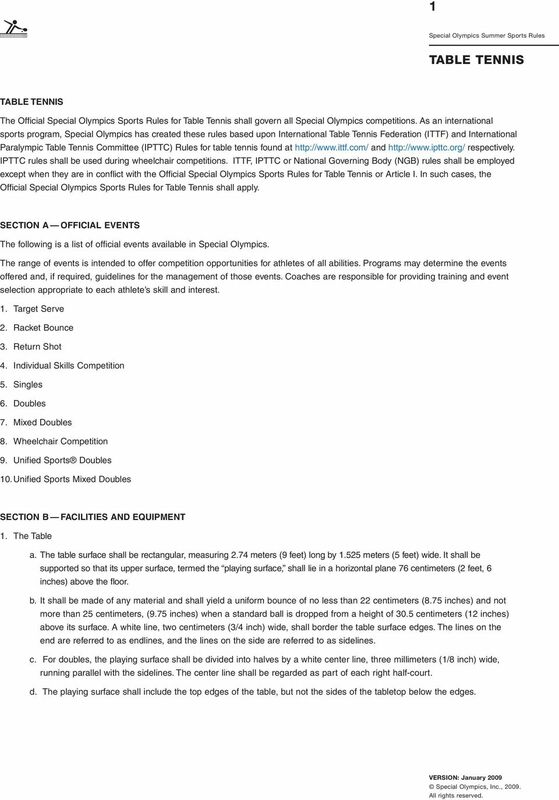 As an international sports program, Special Olympics has created these rules based upon International Table Tennis Federation (ITTF) and International Paralympic Table Tennis Committee (IPTTC) Rules for table tennis found at and respectively. IPTTC rules shall be used during wheelchair competitions. 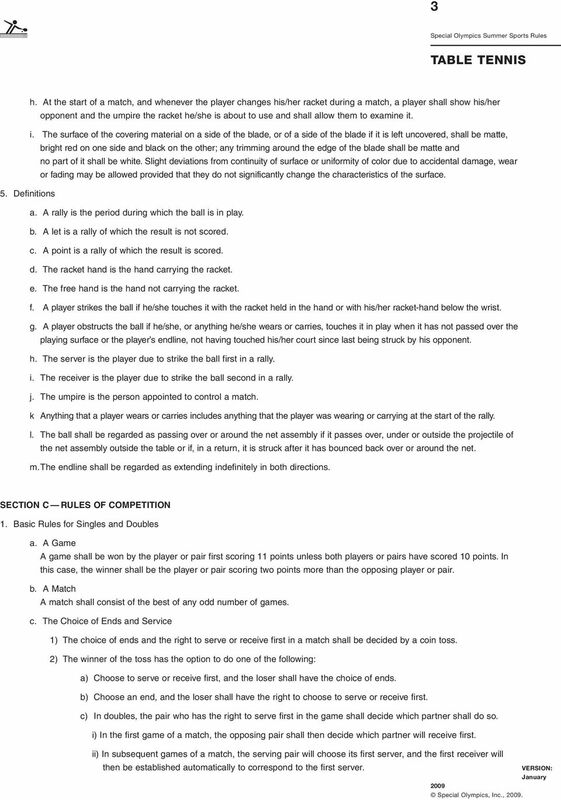 ITTF, IPTTC or National Governing Body (NGB) rules shall be employed except when they are in conflict with the Official Special Olympics Sports Rules for Table Tennis or Article I. In such cases, the Official Special Olympics Sports Rules for Table Tennis shall apply. SECTION A OFFICIAL EVENTS The following is a list of official events available in Special Olympics. The range of events is intended to offer competition opportunities for athletes of all abilities. Programs may determine the events offered and, if required, guidelines for the management of those events. Coaches are responsible for providing training and event selection appropriate to each athlete s skill and interest. 1. Target Serve 2. Racket Bounce 3. Return Shot 4. Individual Skills Competition 5. Singles 6. Doubles 7. Mixed Doubles 8. Wheelchair Competition 9. Unified Sports Doubles 10.Unified Sports Mixed Doubles SECTION B FACILITIES AND EQUIPMENT 1. The Table a. The table surface shall be rectangular, measuring 2.74 meters (9 feet) long by meters (5 feet) wide. It shall be supported so that its upper surface, termed the playing surface, shall lie in a horizontal plane 76 centimeters (2 feet, 6 inches) above the floor. b. It shall be made of any material and shall yield a uniform bounce of no less than 22 centimeters (8.75 inches) and not more than 25 centimeters, (9.75 inches) when a standard ball is dropped from a height of 30.5 centimeters (12 inches) above its surface. A white line, two centimeters (3/4 inch) wide, shall border the table surface edges. The lines on the end are referred to as endlines, and the lines on the side are referred to as sidelines. c. For doubles, the playing surface shall be divided into halves by a white center line, three millimeters (1/8 inch) wide, running parallel with the sidelines. The center line shall be regarded as part of each right half-court. d. The playing surface shall include the top edges of the table, but not the sides of the tabletop below the edges. 2 2 1.52m 5' 15.25cm 6" 15.25cm 6" e. Diagram 2.74m 9' 76cm 2'6" 2. The Net a. The playing surface shall be divided into two courts of equal size by a vertical net running parallel with the endlines. b. The net shall be suspended by a cord attached at each end to upright posts that are centimeters (6 inches) high. c. The net, with its suspension, shall be 183 centimeters (6 feet) long, and its top, along its whole length, shall be centimeters (6 inches) above the playing surface. The bottom of the net, along its whole length, shall be close to the playing surface, and the ends of the net shall be close to the supporting posts. d. The net assembly shall consist of the net, its suspension and the supporting posts, including the clamps attaching them to the table. 3. The Ball a. The ball shall be spherical with a diameter of 40 millimeters (1.57 inches). b. The ball shall weigh 2.7 grams. c. The ball shall be made of celluloid or similar plastic material and shall be white, or orange and matte. 4. The Racket a. The racket may be of any size, shape or weight. b. The blade shall be of wood, continuous of even thickness, flat and rigid. c. At least 85 percent of the blade, by thickness, shall be of natural wood. d. An adhesive layer within the blade may be reinforced with fibrous material, such as carbon fiber, glass fiber or compressed paper, but shall not be thicker than 7.5 percent of the total thickness or 0.35 millimeters, whichever is the smaller. e. A side of the blade used for striking the ball shall be covered with either ordinary pimpled rubber, with pimples outwards, having a total thickness, including adhesive, of not more than 2 millimeters (1/16 inch) or sandwich rubber, with pimples inwards or outwards, having a total thickness, including adhesive, of not more than 4 millimeters. f. The covering material shall extend up to but not beyond the limits of the blade, except that the part nearest the handle and gripped by the fingers may be left uncovered or covered and should be considered part of the handle. g. The blade, any layer within the blade and any layer of covering material or adhesive on a side used for striking the ball shall be continuous and of even thickness. 4 4 d. The Change of Ends The player or pair starting at one end in a game shall start at the other end in the next game of the match. In the last possible game of the match, the players or pairs shall change ends when first one player or pair scores five points. e. The Order of Play 1) In singles, the server shall first make a good service, the receiver shall then make a good return and, thereafter, service and receiver alternately shall each make a good return. 2) In doubles, the server shall first make a good service, the receiver shall then make a good return, the partner of the server shall then make a good return, the partner of the receiver shall then make a good return and, thereafter, each player alternately in that sequence shall make a good return. f. The Change of Service 1) After each two points have been scored, the receiving player or pair shall become the serving player or pair and so on until the end of the game, unless both players or pairs score 10 points or the expedite system is in operation (when the sequence of serving and receiving shall be the same, but each player shall serve for only one point in turn). 2) Doubles a) The first two services shall be delivered by the selected partner of the pair which has the right to serve and shall be received by the appropriate partner of the opposing pair. b) The second two services shall be delivered by the receiver of the first two services and shall be received by the partner of the first server. c) The third two services shall be delivered by the partner of the first server and shall be received by the partner of the first receiver. d) The fourth two services shall be delivered by the partner of the first receiver and shall be received by the first server. e) The fifth two services shall be delivered and received as the first two services, and so on, until the end of the game or if the score is tied at 20 points. f) In each game of a doubles match, the initial order of receiving shall be opposite to that in the immediately preceding game. 3) When the score is tied at 10 points, the sequence of serving and receiving shall be the same, but each player shall deliver only one service in turn until the end of the game. 4) The player or pair who serves first in a game shall receive first in the immediately subsequent game and so on, until the end of the match. 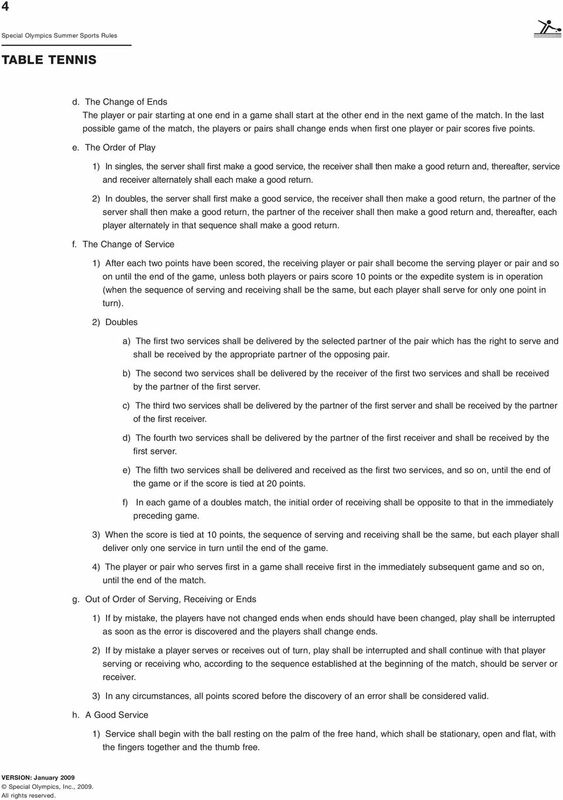 g. Out of Order of Serving, Receiving or Ends 1) If by mistake, the players have not changed ends when ends should have been changed, play shall be interrupted as soon as the error is discovered and the players shall change ends. 2) If by mistake a player serves or receives out of turn, play shall be interrupted and shall continue with that player serving or receiving who, according to the sequence established at the beginning of the match, should be server or receiver. 3) In any circumstances, all points scored before the discovery of an error shall be considered valid. h. A Good Service 1) Service shall begin with the ball resting on the palm of the free hand, which shall be stationary, open and flat, with the fingers together and the thumb free. 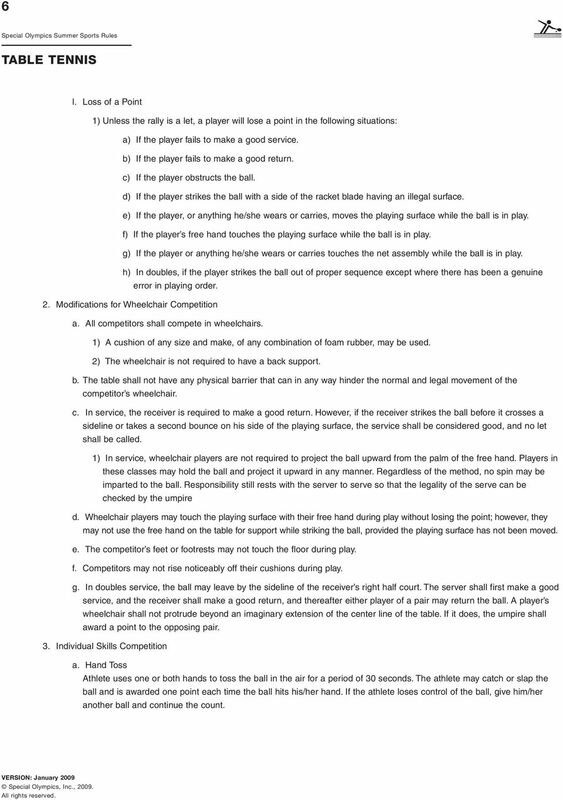 5 5 2) The free hand and the racket shall be above the level of the playing surface from the last moment at which the ball is stationary on the palm of the free hand until the ball is struck in service. 3) The server shall then project the ball upwards, by hand only and without imparting spin, so that it rises near vertically from the palm of the hand at least 16 centimeters (6 inches). 4) As the ball descends from the height of its trajectory, the server shall strike it so that it touches first his/her own court then passes directly over the net or its supports and subsequently touches the receiver s court. 5) In doubles, the points of contact of the ball with the playing surface shall touch successively the right half court of server and receiver. 6) If, in attempting to serve, a player fails to strike the ball while it is in play, he/she shall lose a point. 7) When the ball is struck in service, it shall be behind the end line of the server s court or an imaginary extension thereof, but not farther back than the part of the server s body, other than his/her arm, head or leg, which is farthest from the net. 8) Where there is a clear failure to comply with the requirements for a good service, no warning should be given, and a point should be awarded to the opponent. i. A Good Return a) Except when an assistant umpire has been appointed, the umpire may, on the first occasion in a match at which he/she has a doubt about the correctness of a player s service, interrupt play and warn the server without awarding a point. On any subsequent occasion in the same match in which the same player s service action is of doubtful correctness, for the same or for any other reason, the player shall not be given the benefit of the doubt and shall lose a point. b) Strict observance of the prescribed method of service may be waived (when the umpire is notified before play begins) if compliance is prevented by a physical disability. 1) The ball, having been served or returned in play, shall be struck so that it passes over or around the net assembly and touches the opponent s court either directly or after touching the net assembly. 2) If the ball, having been served or returned in play, returns with its own impetus over the net, it may be struck so that it directly touches the opponent s court. j. Ball in Play The ball shall be in play from the last moment at which it is stationary before being projected in service until it touches anything other than the playing surface, the net assembly, the racket held in the hand or the racket hand below the wrist, or if the rally is otherwise decided as a let or a point. k. A Let 1) A rally is a let in the following instances: a) If the ball served, in passing over or around the net, touches it or its supports, provided the service is otherwise good or is obstructed by the receiver or his partner. b) If the service is delivered when, in the opinion of the umpire, the receiving player or pair is not ready, provided that neither the receiver nor his/her partner attempts to strike the ball. c) If, in the opinion of the umpire, failure to make a good service or a good return or otherwise to comply with the rules is due to a disturbance outside the control of the player. d) If the rally is interrupted for correction of an error in playing order or ends. e) If the service is interrupted for warning a player for a service of doubtful correctness. f) If the conditions of play are disturbed in a way which, in the opinion of the umpire, is likely to affect the outcome of the rally. 6 6 l. Loss of a Point 1) Unless the rally is a let, a player will lose a point in the following situations: a) If the player fails to make a good service. b) If the player fails to make a good return. c) If the player obstructs the ball. d) If the player strikes the ball with a side of the racket blade having an illegal surface. e) If the player, or anything he/she wears or carries, moves the playing surface while the ball is in play. f) If the player s free hand touches the playing surface while the ball is in play. 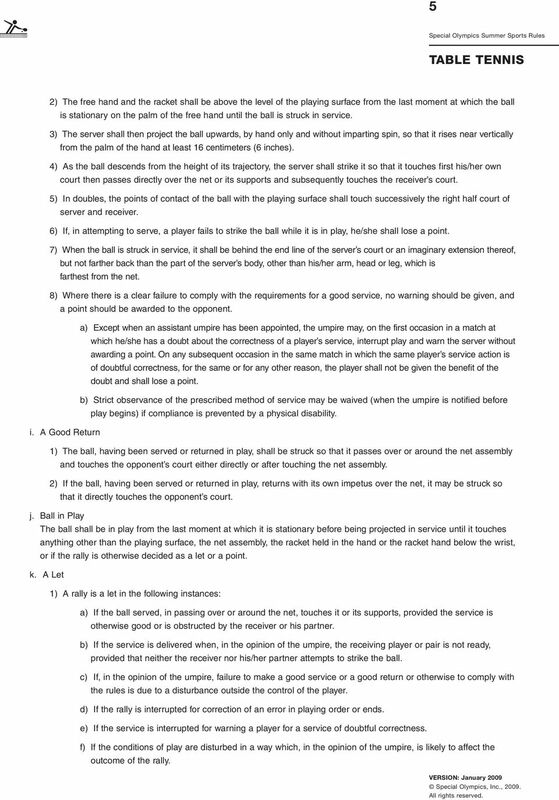 g) If the player or anything he/she wears or carries touches the net assembly while the ball is in play. h) In doubles, if the player strikes the ball out of proper sequence except where there has been a genuine error in playing order. 2. Modifications for Wheelchair Competition a. All competitors shall compete in wheelchairs. 1) A cushion of any size and make, of any combination of foam rubber, may be used. 2) The wheelchair is not required to have a back support. b. The table shall not have any physical barrier that can in any way hinder the normal and legal movement of the competitor s wheelchair. c. In service, the receiver is required to make a good return. However, if the receiver strikes the ball before it crosses a sideline or takes a second bounce on his side of the playing surface, the service shall be considered good, and no let shall be called. 1) In service, wheelchair players are not required to project the ball upward from the palm of the free hand. Players in these classes may hold the ball and project it upward in any manner. Regardless of the method, no spin may be imparted to the ball. Responsibility still rests with the server to serve so that the legality of the serve can be checked by the umpire d. Wheelchair players may touch the playing surface with their free hand during play without losing the point; however, they may not use the free hand on the table for support while striking the ball, provided the playing surface has not been moved. e. The competitor s feet or footrests may not touch the floor during play. f. Competitors may not rise noticeably off their cushions during play. g. In doubles service, the ball may leave by the sideline of the receiver s right half court. The server shall first make a good service, and the receiver shall make a good return, and thereafter either player of a pair may return the ball. A player s wheelchair shall not protrude beyond an imaginary extension of the center line of the table. If it does, the umpire shall award a point to the opposing pair. 3. Individual Skills Competition a. Hand Toss Athlete uses one or both hands to toss the ball in the air for a period of 30 seconds. The athlete may catch or slap the ball and is awarded one point each time the ball hits his/her hand. If the athlete loses control of the ball, give him/her another ball and continue the count. 7 7 b. Racket Bounce Athlete scores one point for each time he/she uses the racket to bounce the ball upward in the air over the course of 30 seconds. If the athlete loses control of the ball, hand him/her another ball and continue the count. c. Forehand Volley Athlete stands on his/her side of the table with another player (feeder) on the other side. Using a total of five balls, the feeder tosses each ball to the athlete s forehand side. The athlete scores one point for hitting the ball back to the feeder s side of the table. The ball must hit the table to count as a point. The athlete scores five points for hitting into either service box. d. Backhand Volley Same as forehand volley, except the feeder sends the ball to the athlete s backhand side. e. Serve The athlete shall serve five balls from the right side of the table and five balls from the left side of the table. A ball that lands in the correct service box will count as one point. f. Final Score A player s final score is determined by adding together the scores achieved in each of the five events which comprise the Individual Skills Contest. 4. Unified Sports Doubles and Mixed Doubles a) Each Unified Sports doubles team shall consist of one athlete and one partner. b) Each team shall determine its own order of service. 5. Target Serve The athlete shall serve five balls from the right side of the table and five balls from the left side of the table. A ball that lands in the correct service box will count as one point. 6. Racket Bounce a. Using the racket, the athlete attempts to hit the ball upwards into the air as many times as possible during a 30-second time limit. b. 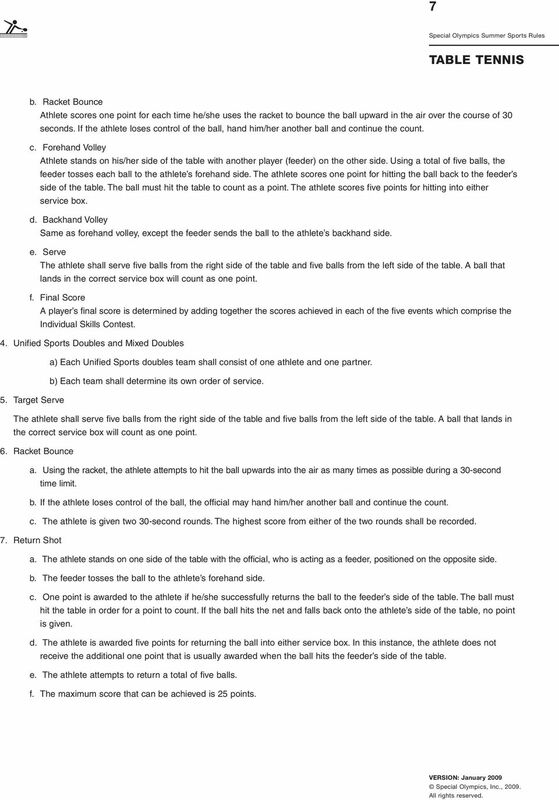 If the athlete loses control of the ball, the official may hand him/her another ball and continue the count. c. The athlete is given two 30-second rounds. The highest score from either of the two rounds shall be recorded. 7. Return Shot a. The athlete stands on one side of the table with the official, who is acting as a feeder, positioned on the opposite side. b. The feeder tosses the ball to the athlete s forehand side. c. One point is awarded to the athlete if he/she successfully returns the ball to the feeder s side of the table. The ball must hit the table in order for a point to count. If the ball hits the net and falls back onto the athlete s side of the table, no point is given. d. The athlete is awarded five points for returning the ball into either service box. In this instance, the athlete does not receive the additional one point that is usually awarded when the ball hits the feeder s side of the table. e. The athlete attempts to return a total of five balls. f. The maximum score that can be achieved is 25 points. The text describes a particular sport or physical activity, and relates its history, rules, playing techniques, scoring, notes and news.